Place cranberries, vinegar, red wine, sugar and rosemary in a bowl and stir to combine. Spread on a rimmed baking sheet and bake for 15 minutes. Transfer to a bowl and season to taste with salt and pepper. Place sliced baguette on a baking sheet and drizzle with olive oil. Bake at 350 degrees for 15 minutes or until light golden brown. As soon as you remove the crostini from the oven, place one slice of brie atop each crostini, allowing it to melt into the bread. 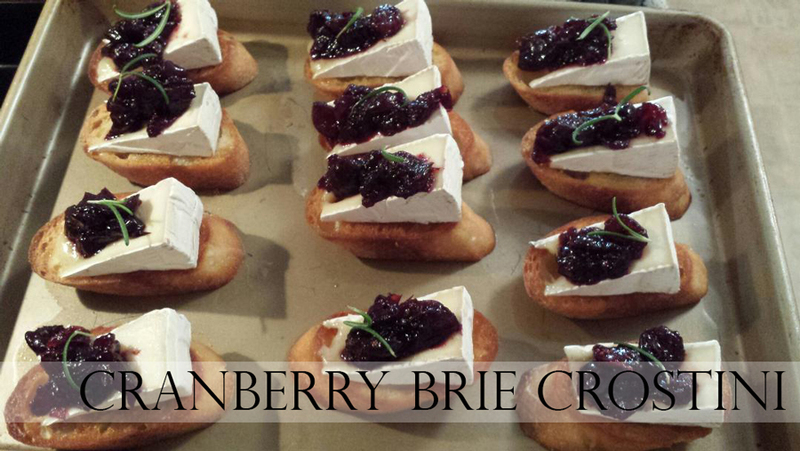 Add a dollop of the cranberry mixture atop the cheese and garnish with a sprig of rosemary.